1. A Good Foundation. Just as with your house, it all starts with a good foundation. 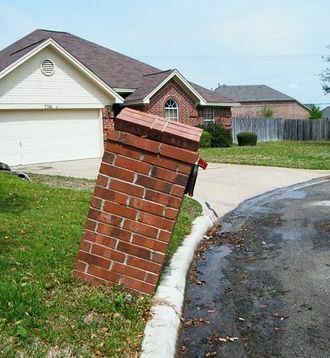 Have you ever seen a brick mailbox leaning over? This is due to an inadaquate foundation, and can easily be avoided with a proper foundation design. Leaning mailboxes simply do not have adequate foundations, but can often be straightened without having to rebuild. Cutting corners here could cause your new mailbox to lean after just a few months. Brick Doctor gets called regularly to solve such problems…we want you to avoid this frustrating and expensive predicament! Brick Doctor mailboxes remain plumb, because we dig and pour a 4” deep concrete slab with rebar, with a 12” deep stabilizing pier in the center to help keep it true for life. This takes a little more time and effort, but can save a lot of frustration later. 2. Top-Quality Materials. Don’t overlook the importance of choosing the right brick, mailbox, and even mortar. You want the brick and mortar to match your home, and for the entire mailbox and structure to hold up well over time…remember, this structure is exposed to the elements–much like your chimney–and is subject to more wear than the brick on your house, which is protected by the roof overhang. If you have brick left over from the days the house was built, you have a great head start and deserve a discount. If not, no problem…the extra time and effort involved in locating and delivering matching brick for your mailbox is included in our prices…and we guarantee a reasonable match! Even the mortar should reasonably match that of your home to insure the finished mailbox compliments the architecture well, adding to the value of your property. Also note that if your brick is antique, adobe, or a common soft variety, you may need to have a water repellent applied to it every 7-10 years to protect it from deteriorating over time. What about the box itself? Drive down your street and notice the receptacles. Most mailbox receptacles are designed to be placed on a wooden post and are intended to be replaced periodically. 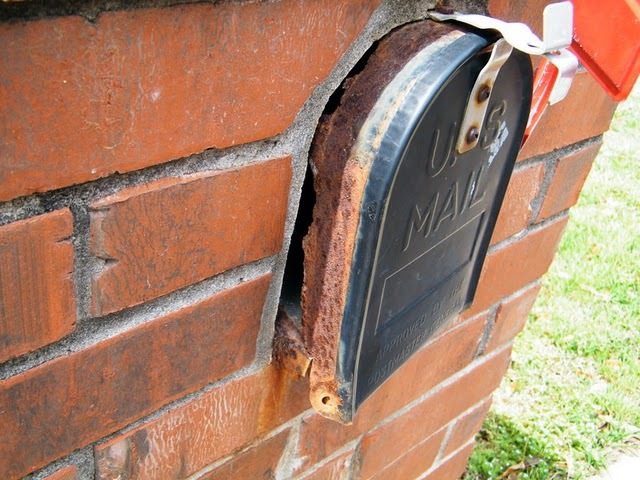 When a cheap insert is embedded into a solid brick mailbox, five to ten years can leave you with a rusted, worn-out or damaged door or insert. The thin sheet metal is susceptible to rust, vandalism, and excessive wear. Many of the doors are attached with flimsy rivets and tend to rust or become easily damaged beyond repair. A rusted out mailbox receptacle, while difficult and expensive to replace, rarely warrants rebuilding the structure- but it’s a great time to consider an upgrade. A permanent brick structure demands a better mailbox—one that will last as long as the brick. Brick Doctor standard mailboxes come with a Tuff-Box®, a slightly oversized, heavy-gauge steel mailbox with a three-stage baked on powder-coat finish and a continuous piano-hinged door. This box comes with a lifetime warranty from the manufacturer. 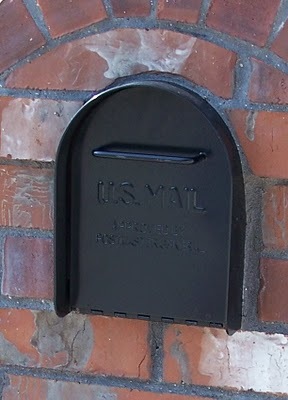 Brick Doctor’s standard 20-lb “TuffBox” mailbox receptacle lasts much better than a standard metal insert. 3. Excellent Craftsmanship. Brick Doctor’s masons are true artisans – trained to carefully construct your mailbox to our exacting standards. Joints will be tooled and brushed to resemble the finish of your house. 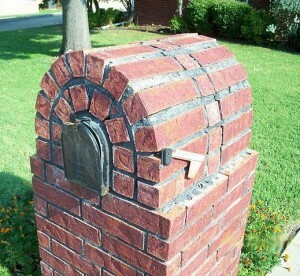 Have you ever seen exposed brick holes in a mail box? This practice is becoming common place, but looks highly unprofessional. Brick Doctor mailboxes are built with no exposed brick holes…only faces of the brick will show on all exposed surfaces, even if it requires making additional saw-cuts. Rebuilding the top portion of this mailbox would allow replacement of the box and flag, redesigning the shape to cover the exposed holes in the brick, and improving the craftsmanship with more uniform brick cuts in the arch. Brick Doctor crowns are also crafted with 100% brick, not sloping mortar. Mortar simply doesn’t last well as a trowelled finish and looks cheap. The next two pictures offer an alternative view of precision cut bricks that not only look better but the even mortar joints will last longer. Precision brick cuts look great but also limit exposure of mortar to weathering and wear. Special designs are created by cutting the brick with a saw as needed (instead of breaking it with a trowel or hammer, which leaves uneven edges). Precision-cut bricks, carefully tooled mortar joints, and a top-quality insert are fine details that distinguish this simple brick mailbox from most others. Also, a pedestal-type base and/or projecting course(s) at the top are available at no additional charge. 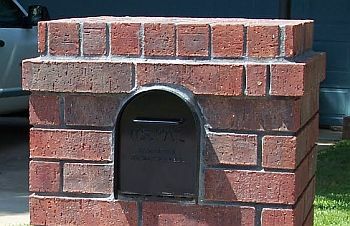 A projecting course of brick dresses up the design of this basic flat-top brick mailbox. 4. Handsome Styles. 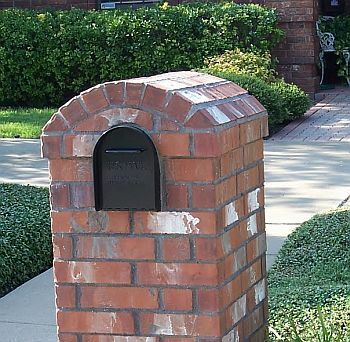 Even the most basic brick mailbox can be quite an attractive addition to your property if it matches the characteristics of your home’s architecture. Matching the brick (or stone) on your home is critical, but we also recommend that you choose features that match your home. 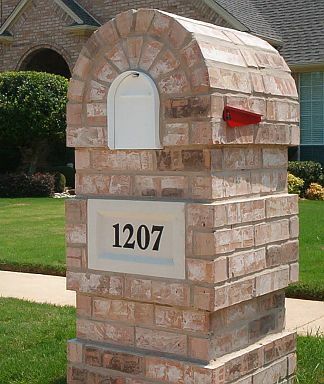 If your home has arches, perhaps an arched mailbox would look best. Similarly, quoin corners, stone accents, cast stone features, and other elements found on the home may be utilized to add depth and beauty to the mailbox as well. For more design ideas see our Mailbox Design Options Page. A Proverb advises, “Let another praise you, and not your own mouth; someone else, and not your own lips” (Prov. 27:2). 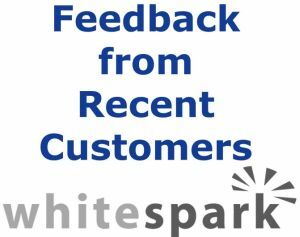 Please check out what others say about us by checking out our list of testimonials. 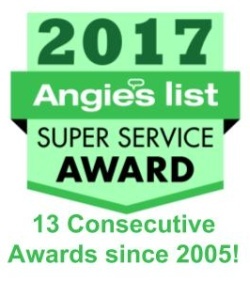 You can verify our reputation with the BBB or Angie’s List… or, just ask your neighbors. Any Questions? Need more Answers? Feel Free to Contact Us. Feel Free to call or email .